Universal Foundation on the World Disability Day Congratulates the Tamil Nadu Government for taking steps towards the welfare of the disabled people and for making Tamil Nadu number one among all other states in taking care of the disabled people. Click to view the greeting of the Tamil Nadu CM to all disabled people on the World Disability Day. Universal Foundation is happy to announce that Dr.Ajay Vasant has been appointed in the Advisory Committee of the DARE (Differently Abled Rights Exnora) initiative. The initiative is to ensure the fundamental human rights for the Differently Abled.Dignity and Respect to the Differently Abled are the Vision and Mission of DARE. "SPONSOR A SENIOR CITIZEN" service was launched by Universal Foundation on 12th of May 2013.This is a unique service where people can sponsor a group of senior citizens for a lunch or they can sponsor for the whole month and make their day memorable. Donations are invited for the old people who are neglected by their own kith and kin.Universal Foundation intends to help the old people with food and clothing. 1.Universal Foundation in association with Lions Club of Chennai organised "2013 Film Awards" on 01st of January 2013.It was a fund raising program for Children affected with Cancer. The proceedings of the tickets were used for the upliftment of children affected with cancer. 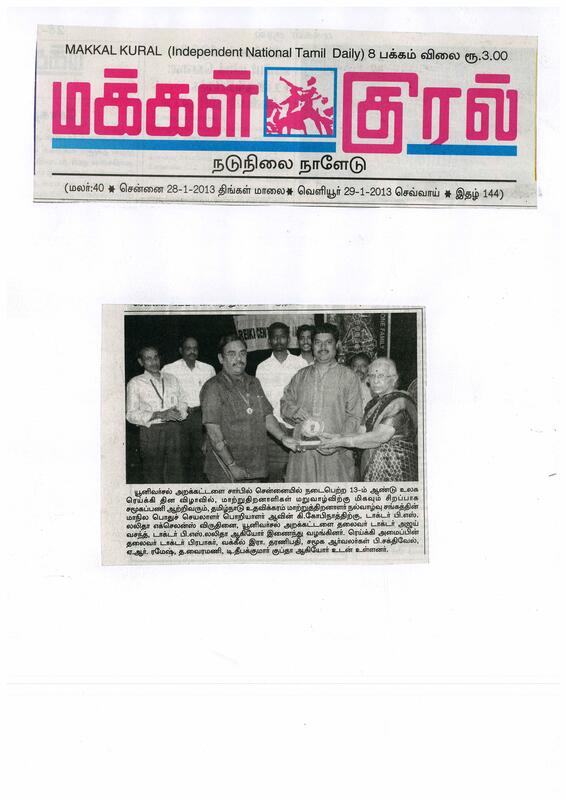 2.Universal Foundation presented "Dr.P.S.Lalitha Excellence Award" for the year 2013 for promoting "Alternative Therapy" and "Social Service". "Dr.P.S.Lalitha Excellence Award" for Social Service was given to Mr.Mallika Arjunan and Mr.Gopinath and "Dr.P.S.Lalitha Excellence Award" for promoting Alternative Therapy was given to Mrs.Saroja Kannan on 26th January 2013.